“We’ll keep going, learn from it, as we’ve done every single experience we’ve had this year,” Horan says. James Horan during the final few moments of yesterday's All-Ireland SFC final. JAMES HORAN INSISTS his young Mayo side will learn form yesterday’s All-Ireland SFC final defeat to Donegal. The Connacht champions lost out to Jim McGuinness’s side at Croke Park, thanks in no small part to Donegal’s two first-half goals. “Yeah, the two of them should have been defended better,” Horan told reporters afterwards. “The first goal Michael Murphy won one of the first balls in and got a yard and then produced a very good shot. It’s not like us though. The second goal came from a ball hitting off a post. We had it again but then dropped it. That was hard to take. “The second goal came from us having the ball in our corner-forward spot but we dropped it there again. With the Ulster side in front at the break, Horan explained that he just told his charges to keep plugging away, having already made inroads to the Donegal lead in the moments before half-time. “Just keep playing. And playing our game. Because in the second quarter we were dominant, very dominant, and were doing a lot of things right. So it was just pretty much more of the same. “I think one or two of their first points, again, came from a basis mistake that we made. But look it, I’m sort of repeating myself here. But that’s the way I would see the game, and the way it sort of petered out. I’m not sure what Donegal got from play, but their two goals, obviously, if you took those out, it would be a different scenario. But look it we’ll have take it on the chin, learn from it. 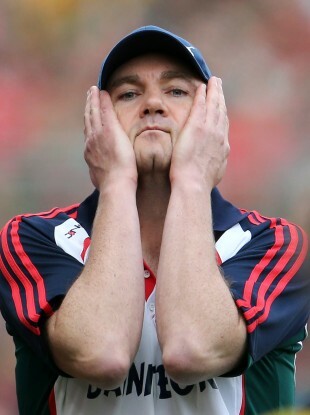 Email “We'll be back, insists chief Horan as Mayo look for positives”. Feedback on “We'll be back, insists chief Horan as Mayo look for positives”.